Type. The creature’s type becomes undead. Incorporeal. Ghosts can phase through solid objects as if they were difficult terrain. If they stop in a solid object, they take 5 (1d10) force damage. In addition, they are capable of seeing (60 ft.) and dwelling in the Ethereal plane as they are in the Material plane. It cannot normally interact with physical objects like corporeal beings can. Cursed. This type of ghost is cursed to a certain area until it can find peace. It cannot be healed through healing spells or potions. Upon dropping to 0, the haunt fades away before returning the following night. The haunt can only truly die once it has addressed its final desires. This type of ghost can break from its haunting spot, if its quest matches with its final desires. Completing the quest will most likely cause the ghost to pass on to an after world. Withering Touch, Etherealness, Horrifying Visage and Possession (Recharge 6) work as they do in the Monster Manual description of a ghost. This can be found on page 147. Spellcasting. 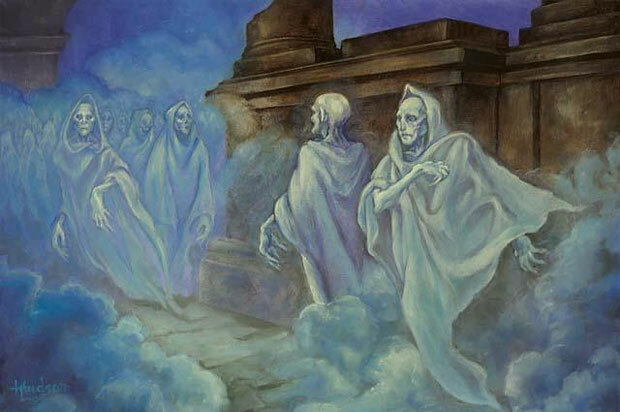 Ghostly Haunts retain any spells they had in life. However, it may be possible that casting through the Ethereal can lead to problems. If ghosts do not exist on an ethereal in your setting, ignore this. Weaponry. Weaponry that was especially close to them in life materializes on their ghostly person, dealing force damage instead of their original damage. Multiattacks only work with their weapons and attacks from when they were alive, not their Withering Touch. Challenge Adjustment – Add 2 to the total challenge of the creature. Ghost PCs – Creating ghostly PCs can be potentially problematic due to ways that greatly defer from default D&D play rules. None the less, PCs who become ghosts in this manner inherit the traits found in the above template, similar to rules for Vampire PCs or Werewolf PCs.